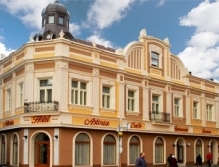 Our hotel is situated in the historical centre of the city of Satu Mare, within 10 km from the Hungarian border, respectively 25 km from the Ukraine border. The architectural style and its interior decoration remind us of atmosphere at the end of the XIX-th century. Our restaurant meets in an elegant way all the culinary demands of our guests. 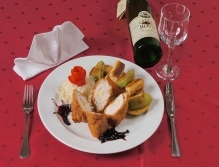 We provide professional services and an a la carte menu, which contains many international dishes and, of course, many traditional specialties. 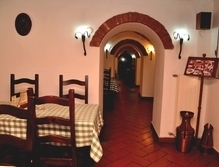 Our "Tavern" offers a pleasant Pub-feeling, where our guests can have a glass of wine from Minis vineyard (Wine Princess) and can satisfy their culinary tastes having huge portions prepared in our kitchen. Next to our restaurant we have a completely separate conference room, equipped with air conditioning and wireless internet. The room can accommodate up to 40 people and it can be prepapred by any preference.